With the beginning of the 2018 academic year comes the end of the 2018 Summer Inquiry Program. The Summer Inquiry Program offers scholarships to students who spend three months in service with a church-related service or mission agency. The goal of the Inquiry Program is to facilitate significant student engagement with service under the sponsorship of a church agency and through the instruction of an on-site mentor. While in the program, students are expected to learn from both their active service and from observation of others engaged in service. They are also expected to participate actively in the life of their service unit, including involvement with a local congregation. Five to eight students are allowed to participate in the program each year. In 2018, students took part in two inquiry programs: Camping Inquiry Program (CIP), where students are connected with a church-related camping or retreat center to experience nature and outdoor ministry and Ministry Inquiry Program (MIP), where students learn about ministry programs ranging from worship planning and leading, teaching Bible or Sunday School, leading music, preaching and more. Levi Glick, a sophomore sign language interpreting major from Salem, Oregon, participated in CIP at Drift Creek Camp in Lincoln City, Oregon. Glick said he learned about the program as a camper at Drift Creek Camp when Skye McKinnell and Carter McKay-Epp, both seniors, were counselors as part an earlier CIP. “I guess my favorite memory or story was performing a skit with my cabin for the talent show during 5th and 6th-grade week,” Glick said, adding that he enjoyed his experience as a counselor at Drift Creek Camp. The campers put together a skit acting as various counselors. Glick said that he felt like others would enjoy the Inquiry Program. Glick said that students can only participate in CIP once, but he “would participate again” if he could. Madeline Kauffman, a sophomore computer science major, participated in MIP, which she had learned about from a Communicator announcement. “That led to me doing a little more research about the program,” she said. She spoke with Bob Yoder, the head of the Inquiry Program at the time, to learn more about the program, and also spoke with another student to hear their personal experience as a Ministry Inquiry participant. “It had moved beyond interest to something I definitely wanted to do,” she said. Kauffman worked at Hyattsville Mennonite Church in Hyattsville, Maryland, alongside pastors Cindy Lapp and Michelle Burkholder. While she worked in Maryland, Kauffman lived in Washington, D.C.
“I did everything from worship leading, preaching and pastoral care visits to immigration advocacy, protesting, serving at food kitchens, working at the International Guest House and exploring the city,” said Kauffman of her MIP experience. Kauffman said it would be hard to pick a favorite story, but decided her favorite day was the first Sunday she preached. Kauffman also highlighted the day she learned that a local immigrant, whom the church had been advocating for, was being released from detention and would to be allowed to stay in the United States. “That news reminded me of the power of protest and making calls to representatives,” said Kauffman. 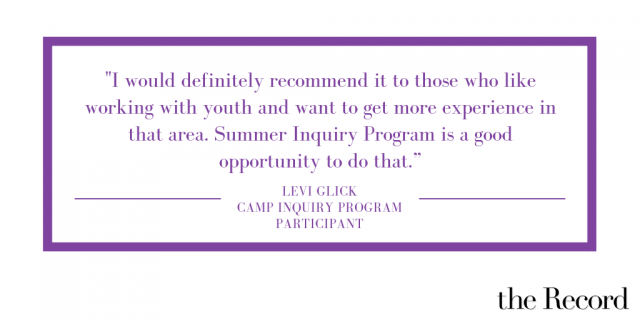 Kauffman, like Glick, highly recommend participating in the Summer Inquiry Program. Any students who wish to participate in the 2019 Summer Inquiry Program should send in an application before the early-bird deadline, Dec. 1, or the final deadline, Jan. 31. More information can be found on Goshen College’s Summer Inquiry Program website.